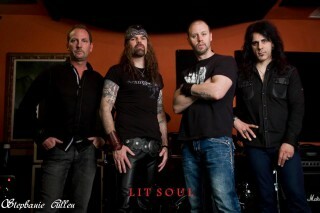 Lit Soul, known for their substantial views on life and politics, and belief in a better world, have recently reformed and are already making a mark in 2012. Mark II that is. Rob Chevelle, creator and founder of Lit Soul, has joined forces with Joe Dagilus, Brian Sowers and Joey Petro to form a brand new, heavier, line-up. I caught up with Rob Chevelle, and lead guitarist Joe Dagilus to talk about what brought them all together, how their direction has changed, and what their future holds. HELP ROB CHEVELLE OF LIT SOUL GET ON THE ALEX JONES SHOW AT INFOWARS.COM!! !